illus. 20 cm. 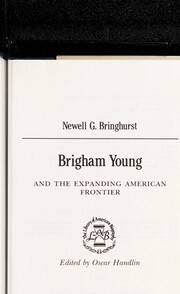 246 p.
Brief, paperback biography that discusses Brigham Young, leader in the Latter Day Saint movement. 100 ME:PersonalName $a Personal name Bringhurst, Newell G.
300 Physical Desc $b Other physical details illus. 520 Summary $a Summary, etc. note Brief, paperback biography that discusses Brigham Young, leader in the Latter Day Saint movement.